BEIJING - China's second lunar probe, Chang'e-2, ceased orbiting the moon on Thursday afternoon after completing several preliminary missions and set off to explore outer space. The lunar satellite is to travel 1.5 million kilometers away from the Earth's surface in at least 85 days, going to what is called a Lagrangian point, said Wang Xiaolei, deputy designer of the Chang'e-2 satellite. Lagrangian points are locations in space where gravitational forces and the orbital motion of a body balance each other. They were discovered in 1772 by the French mathematician Louis Lagrange, who was working on a solution to the "three-body problem". The problem arose after scientists began wondering how a third, small body would orbit around two large bodies that are also in orbit. There are five Lagrangian points in the Sun-Earth system, and the Chang'e-2 will fly to one of those nearest the Earth. 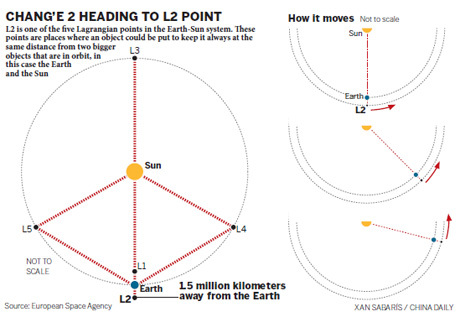 Wang said the point (marked as L2 in the chart) lies in the Earth's shadow and is exposed to less sun radiation than other Lagrangian points. Several US and European satellites now occupy that spot, said Pang Zhihao, a researcher and deputy editor-in-chief of the magazine Space International. "If the Chang'e-2 can get there, that will lay the groundwork for China's future exploration of deep space," he said. But China has never tried to send a satellite so far before. "Chang'e-2's new mission will pose a big challenge to the country's ability to track and control (satellites) in deep space," he said. Chang'e-2's new mission poses another difficulty: This is the first time scientists have tried to pilot a satellite out of a moon orbit and take it to the L2 point. Previous satellite trips to the point have all started from Earth, an anonymous expert was quoted by the China Central Television on Thursday as saying. The new mission therefore places great pressure on scientists to accurately calculate the point at which the Chang'e-2 must leave its orbit around the moon and make off for the Lagrangian point, the expert said. On Wednesday afternoon, scientists maneuvered Chang'e-2 so it would leave the circular orbit pattern it had been in previously and enter into an elliptical pattern. At 5:10 pm Thursday, a second orbit maneuver was performed and the lunar probe left the moon for the Lagrangian point, according to the State Administration for Science, Technology and Industry for National Defense. If all goes as planned, Chang'e-2 will arrive at its destination in September. Chang'e-2 was launched on Oct 1 this past year. Its chief mission was to test out technology needed to enable an unmanned craft to softland on the moon. China's third lunar probe, Chang'e-3, is to attempt such a landing in 2013. The administration said that Chang'e-2 has completed its main mission, which also had it fly to the moon in a relatively short time and remain in orbit at 15 km away from the lunar surface. China has a three-stage plan for exploring the moon. Chang'e-2 and Chang'e-3 are part of the second stage, which is to lead to an unmanned moon landing. The third stage is to result in a sample of moon rock being brought back to Earth in 2017.